The human body is a pretty remarkable thing to the point that it actually has several different types of internal clocks that helps to keep us ‘ticking along’ for both the daily and seasonal rhythms of life. As we shall see the body’s clocks are controlled and affected by light. Our bodies have an internal clock, that say scientists can even track the passing of the seasons in a “chemical calendar”. Scientists have recently found a cluster of thousands of cells that exist in either a “summer” or “winter” state. The body uses the lengthening days to switch more of them into summer mode and the opposite when the nights draw in. 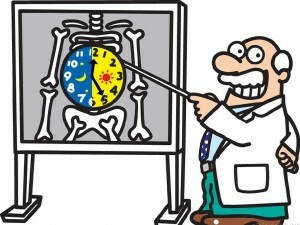 This annual clock controls when animals breed and hibernate and in humans may be altering the immune system. A team of Britsih researchers analysed the brains of sheep at different times of the year. What they found is a cluster of 17,000 “calendar cells” in the pituitary gland, which sits at the base of the brain, and releases hormones that control processes throughout the body. The cells have a “binary system”, much like a computer, that means they can exist in only one of two states – they can either produce “winter” chemicals or “summer” ones. The proportion of the calendar cells in each state changes throughout the year thus marking the passage of time and the seasons. So for periods of the year in the middle of winter and the middle of summer they are all in one state or the other – indicating it’s fully winter or fully summer. The annual pattern is used to trigger migrations, hibernations and mating seasons and ultimately explains why lambs are born in spring. Other studies have also shown that human genes involved with immunity became more active in the cold and could help fight off winter viruses such as flu but may make some conditions like arthritis worse. But what about intermediate states where only some of the cells are in one state and others in another state. That’s were the current resaearch runs out and it’s still not clear how the body knows it is in spring or autumn when some calendar cells are in winter mode and others are in a summer state. This annual clock is known as the circannual rhythm and is the longer-term cousin of the circadian or daily rhythm which keeps us awake at the right time of day – usually ! Mammals, including humans, have a daily clock located in a region of the brain called the hypothalamus. 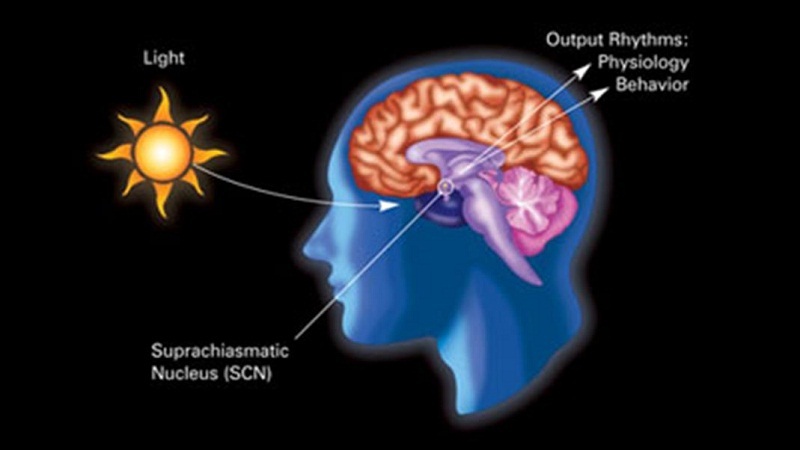 This region, also called the suprachiasmatic nucleus or SCN, receives information about the time of day via the level of illumination fed directy from the eyes. Specialized ganglion cells project the light directly to the SCN, where they help in the synchronization) of a ‘master circadian clock’. Interestingly enough the SCN is also capable of maintaining it’s rhythm even without external cues, like light levels. The SCN takes this information on the lengths of the day and night from the eyes, interprets it, and passes it on to the pineal gland, a tiny structure shaped like a pine cone and located on the epithalamus. In response, the pineal secretes the hormone melatonin. Secretion of melatonin peaks at night and ebbs during the day. It’s this chemical that is resposible for regulating sleep. 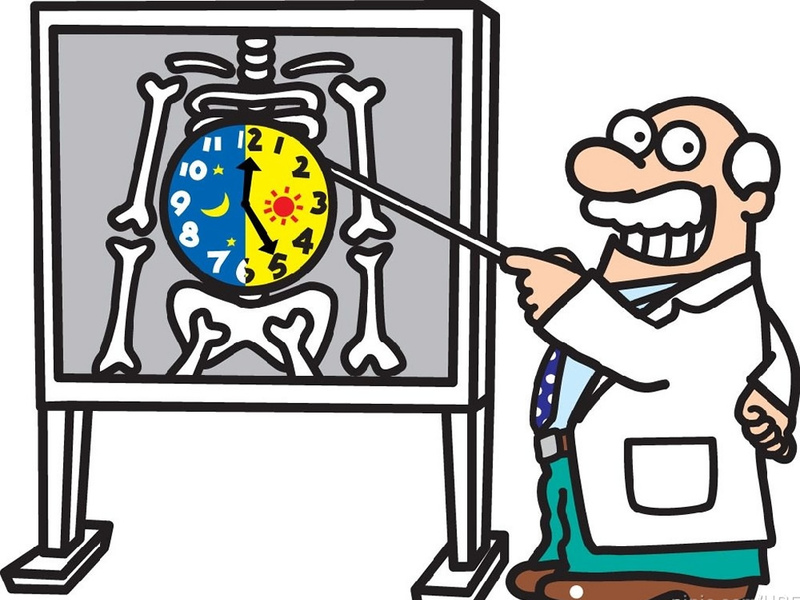 More-or-less independent circadian rhythms can also be found in many other organs and cells in the body outside the suprachiasmatic nuclei (SCN), the “master clock”. These clocks, called peripheral oscillators, are found in the adrenal gland, oesophagus, lungs, liver, pancreas, spleen, thymus, and skin. Why Can’t We Eat Grass ? How Do We Acquire our Own Unique Taste for Foods & Why do they Change Over Time ? Can We Tell What the Lifespan of a Dinosaur was ? Why Were Some Dinosaurs so Large ?